As I finish up this weird final Bobbins story, I've repeatedly asked myself, "what am I doing?" After 16 years and counting of the same continuity, the greatest difficulty I have is making my work approachable to new readers while retaining the old ones. As a comic book reader in my youth, comics leant heavily on continuity, but I never remember it being a huge problem. If someone or something reappeared, it was never a huge mental leap to accommodate the new reality of this returning figure/recurrent situation. Bringing back Bobbins was one of the most fundamentally idiotic things I have ever done and worst of all, I did it because the idea was funny to me. I was talking to my friend Jeremy one afternoon about Bobbins, and the following evening, the slogan "Bobbins is back" sprang to mind. I thought this was hilarious, and drew the original characters' faces in my sketchbook. Within a couple of weeks, I'd done the first strip that appears as part of The Case Of The Forked Road. I loved doing that little story, about how Ryan meets Amy, but I have a feeling that if you were to check it against the original Bobbins comics, there are some... fairly problematic interactions in there. I'm not sure how the project persisted past that original point. The revival has now been going on for half as long as the original comic ran. With Bad Machinery done, and Expecting To Fly (a Bobbins prequel that also includes its fair share of misremembered/fudged history) complete, I thought I'd do some Bobbins comics to fill in while I worked on Giant Days for Boom and Bad Machinery 4 for Oni Press. I never set out to make something convoluted, but as the weeks have gone on, it's folded over and over on itself into something crazy. 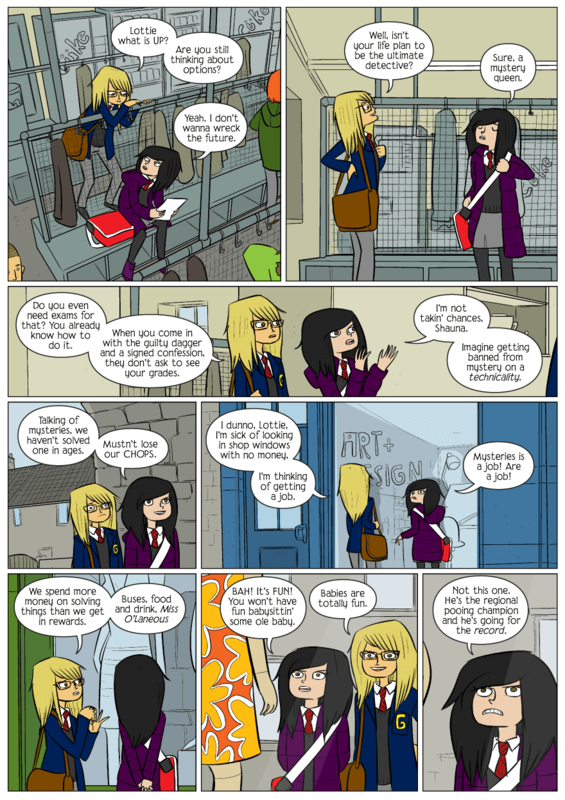 People sometimes ask me why there's Bobbins, and Scary Go Round, and Bad Machinery, "when they're all just the same thing." The answer is, so that I can work out where the line is between these projects, so I don't have to remember too much, so that I can divide it all up semi-neatly. This last Bobbins story is what happens if I take out all those dividing lines in my head, just so you can see what it looks like. It's a mess. I've started to get emails from people asking for clarification on certain "historical" characters, which suggests to me that it's time to stop. Time's pretty much up for the "Tackleverse", which is why I did it - this is the end of the road for a lot of the characters. I hope you enjoyed the experiment as much as I have - it's gone in directions I didn't expect. At the start of April it will be time for something new. After a couple of months of thinking about it, I've decided to conclude Bad Machinery with the Case Of The Modern Men. It feels like the right time to do it. The characters have outgrown the setting, the premise and the format. I've tinkered with the comic for three cases, with mixed results - a whole story of giant pages, then lots of little strips, but I've felt like I was in a holding pattern for the last couple of years. I don't want to stop telling stories with these characters, but I'm not sure I can do much more with them without returning to the drawing board. There's definitely more to come from Charlotte, Shauna and the rest of them, but you might not see much of them for a little while. With the third book released in December and five more stories to go, Oni's beautiful print editions of Bad Machinery should continue unabated. I'm really proud of what they've done with my work. Needless to say, comics won't stop in the meantime. When Expecting To Fly ends this Friday, Bobbins will return for a run of a few months (6 or 7 days a week) while I work on the 4th Bad Machinery book and a (currently secret) print project. I came up with so many ideas creating the idiotic, fictitious "Scary Go Round universe" over the last couple of months, that I see no reason for anyone to panic any time soon. The website will probably revert back to being called "Scary Go Round" as an umbrella for all the different things I've been doing over the last five years. Thanks to everyone who has supported Bad Machinery. Think of this as a Doctor Who-style regeneration in progress. Your friends will be back. Manga Studio 5 EX was released last week and, having used version 4 EX (which I reviewed here for MacWorld) every day for the last four and a half years, I was keen to get my hands on the new version. The upgrade from version 3 to 4 had been a great pleasure, so I had held on for the pro EX version, which included the story management features I use to keep myself organised. What I found was, to put it mildly, a mixed bag. MS5 EX isn't really an upgrade. It's a completely different program. Earlier versions were a westernised version of Celsys Comic Studio. The new version is a different program - Clip Studio. Sadly, it has not been localised very well. Menu options are sometimes offered in a lousy pidgin English that, while close to comprehensible, still leave one in doubt. Were this version of Manga Studio a masterpiece of usability, I don't think this would matter. But it's not. It's a melée of menus, submenus, optional customisations, and interface contradictions so gnomic that one is frequently sent into the seven-fold preference menus to try and right things. Herein lies the contradiction that makes the struggle seem somewhat worth it - at the heart of the madness is an excellent program with which to draw comics. The pen tools are, largely, better. They can be tweaked to your heart's desire. There are new perspective rulers which make a mockery of MS4's fiddly version (though these are retained for those who are used to them). There are a myriad of new colouring features which will please anyone who doesn't want to colour in Photoshop. Huge paper sizes are now available if you need them. It feels snappier. The manual is 650 pages long, I'm sure that there is plenty more iceberg underwater. 1. The pen and pencil cursors are the same. So if you switch between the two with your shortcut key, as I do all day long, you can't tell immediately which one you're using. Of course, should you wish to draw with a pastel, that has its own cursor. Perhaps the pastel lobby is more powerful than the pencil lobby. 2. Correction has been taken out of the pen menus. Good luck digging the mess it is now out and reinstating it. One of the best features of MS3 & 4 was that if you turned correction right up to 20 and drew a stroke, it was a straight line with a variable width based on how hard you pressed down - as if you'd drawn a nib line with a ruler. Now, no matter how you tweak its numerous settings, the super-corrected line shrinks to a razor-thin line. If you relied on that feature to quickly draw lines, you won't be doing that any more. EDIT: I worked out how to make it work like it used to. Click the spanner (bottom right) to bring up tool settings. Select 'correction' from the menu on the left. Click the check box (the little eye) so the 'post correction' option is visible on the tool menu. Check 'bezier curve' only under that. You'll now get straight, relatively uniform lines like MS4 when correction is switched on. Feel free to play with the other settings - bezier curve is the one that restores the familiar behaviour. 3. Instead of numerical sliders to change settings, some options are represented by a series of slightly different grey blocks. Good luck remembering which grey box you clicked, and what numerical value it denotes. EDIT: You can change this. CMD-click on the blocks, select 'show slider'. 4. The straight line and shape drawing tool, panel ruler tools and ruler tools are all under one icon. I found them eventually. Panel cutting was a very neat and tidy operation in version 4, but it's reverted to the complicated setup I think I remember from version 3, generating nested folders and masks. I don't know why. Perhaps someone knows why. EDIT: You can turn the nested folders off (you'll still get one big nested folder) - in the tool properties for "divide frame folder", select "not change". Not change! Now, when you chop things up, all the artwork is behind one mask. 5. The layers palette has been broken into two separate entities. The relationship between these two is as complex and delicate as the relationship between those four organisms that make up the Portuguese Man O War. And as difficult to understand. Remember when there was a button to make your pencils into a blue line? Now, merge a couple of layers, one blue-lined, and things become very complicated very quickly. 6. Remember the old square eraser that you could turn to an angle? And it was big when you zoomed out and small when you zoomed in? I'm sure you can restore that but after an hour of trying, I gave up. EDIT: If you want a square eraser (I couldn't work out how to easily angle it), select eraser, go to tool property, select brush shape, click 'material', look for a brush called 'small', it's a square. 7. Everything is set to anti-aliased. Set aside some time to really enjoy putting things back to 2-bit. 8. There are a lot of new pencils, but they look and feel different to the MS4 pencil. You can import your old pencil, but it doesn't look the same. I'm sure this is something I'll get used to, but it would have been nice to have had the option. You can import all your old tools from MS4 if you wish, but the results are a mixed bag. 9. Saving and organising your page templates has gone from placing them in one simple menu by saving the page as a template, to having to select a load of layers, make them into material, then place them on a paper template, after digging them out from all the other templates provided. 10. The interface is a huge mess. It's a disaster. I heard complaints over the years that MS4 had an ugly interface. It wasn't beautiful, but it worked, and it was easy to get by with a bare minimum of screen real estate lost. The new version is almost exquisite in its visual bloat. I don't think this a bad piece of software, per se. It's learnable. But I honestly think that SmithMicro are dishonest in pushing this as the same line of software. Customisable as it is, they could have made at least some concession to their existing users. Out of the box, it is more disruptive than helpful to long term users. For six or seven years, I've touted Manga Studio as software that makes making comics easier and more pleasant. This is the first version I've used that doesn't do that. And that's a shame. For the new Bad Machinery story I decided to do tall comics. I had been working in a landscape format for three and a half years, and for most of that time I had felt completely constrained by the format. Landscape creates a world of problems with pacing. Or rather, it created a world of problems with pacing for ME. I found myself slicing my two rows up into ever smaller slivers in an attempt to move things along. The new format I'm drawing in isn't really double the size of the old pages - that would take twice as long to draw - it's probably a third to a half more real estate. I am sure that some kind of mathematical hero will tell me exactly how much more room to manoeuvre I have. But the additional space has already started to change the comics - there's room to be thinky and (hopefully) funny at the same time, to switch scenes mid-page, and explore ideas without running out of page. 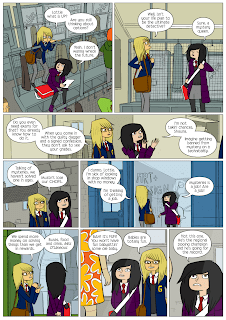 The change of format feels right as well because Bad Machinery is about characters who are getting older with each case, and as they get older, the nature of the comic will change. The adventures of 11 year olds are distinct from what 14 year olds would get up to. I think there's room to make these changes, and define the cases from number 7 onwards differently. When I've seen the Bad Machinery book racked in bookstores, it's a little disappointing to see it next to Batman, rather than with the kids' books. Needless to say, I intend to capitalise on this placement by including a violent night vigilante in all future stories. But the one thing I do like about the landscape format is how much wider than Batman my books are. Stuff you, Caped Crusader. On my older books, just the act of converting to CMYK turned the RGB black into a very rich CMYK - too rich really. But I got away with it. Before I sent my art to Oni, I tried to find out what the correct rich black ratio was. I figured that was the only way I might get away with not having to painstakingly recolour hundreds of pages. If your line art is solid black (ie scanned at a high resolution and not anti-aliased), colour the page any way you want, then convert to CMYK if the page isn't CMYK already, select all the black linework at the end and fill it with a 60C/40M/0Y/100K black. That's it. I've done this for multiple major comic book publishers, as well as on my own self-published work, and it is apparently wholly acceptable in preventing trapping errors (white hairline gaps around the lines when pages aren't properly registered). NOTE: Don't colour your lettering this way. Keep it 0C/0M/0Y/100K or it will look slightly fuzzy on the page. 1. If you have a local comic shop, they can order it for you if it's not in stock. Just ask! It's in the system. 2. In the UK? Amazon.co.uk has it. If you use this link, I get a little bit of extra cash that way. Hate Amazon's tax-dodging ways? Use Foyles. 3. In Australia? Kings Comics has it. I'm afraid you can only get the hardcover direct from Topatoco or direct from Oni Press. If you want a personalised book, I will be selling adhesive personalised bookplates from the beginning of May. For the last fifteen years I've thought it a criminal waste that no one really took notice of Scott Miller, the polymath frontman of Game Theory and the Loud Family. He released ten albums of varying ambition but relentless quality. Albums that I found it hard to pass on to others but that, to me, felt like a precious roadmap to the emotional tundra of a man's early twenties, just as Scott's carefully compiled album charts unlocked huge swathes of music for me and encouraged me to compile my own. With the exception of a brief collaborative return in 2006, Scott stopped making records in 2000 - two years after I first heard his music. Through second hand shops, Amazon, kind friends and music blogs, I was able to plug all the catalogue gaps left by bad deals. The further away we became from this music being made, the easier it was to actually hear it. But it was Scott's writing on loudfamily.com, which never went away, that was his greatest influence on me. Answering fans and allies' questions with exacting precision, he treated pop music, art, literature and science with the same rigour and humour. His answers were gracious, thought-out and kind. When people began to write to me about my own work, I used Scott as my template. I didn't have to think about how to relate to "fans". It was easy. You treated them like smart people. You wrote back to them the way Scott Miller did. His writing on music in recent years was arguably, even better. In a field where drift and posture often stand in lieu of knowledge and perspective, he made the rare distinction of having both. Of course it would take his awful, early passing at 53 for voices to unite in support of this great, thoughtful man. Some of his answers revealed a painful self-deprecation in his awareness of the rock career arc, his withdrawal from the game to avoid pressing on to minimal return. To be told today that he was just about to come back to music was heartbreaking. But that's a selfish feeling. With the words he wrote, with the records he made, he'd done enough. He'd done more than most. This Manchester-based writer, artist and straight-shooter seeks only to delight you. He will not, however, tolerate the casual conversion of a verb or adjective into a noun.